Vonigo is an intuitive, cloud-based field service software for field service-based companies of all sizes. The solution enables businesses to streamline and optimize the field service delivery process to save time and money as they expand. It offers a set of configurable modules which include: Online booking, scheduling, work order management, dispatch, estimation, CRM, invoicing, reporting, GPS, inventory management, onscreen signatures, notifications, route optimization, and payments. The application makes service business perform better. It provides a suite of innovative tools which are accessible anywhere anytime, from any desktop or mobile device. Vonigo allows you to run multi-location business operations more efficiently from a unified platform. It automates the field service delivery and provides valuable insights into sales and customer to boost business performance without more investment. Vonigo is a comprehensive suite of configurable modules that streamline the operation of service businesses to increase sales. The solution is built to be fully-mobile responsive to help you run your business wherever you are. Its business management module is crafted from the group up for productivity and feasibility. The module actively optimizes every operation of your service delivery process and help you save time and money as you grow. The solution is easy to implement and is also configurable to the specific needs of each service business. The online booking engine is another feature worth mentioning. The module integrates seamlessly with your schedule and website to permit potential clients to book estimates or jobs at their most convenient time. The online booking engine presents your service business to potential clients before you visit them. It enables potential clients to find you online and make an immediate buying decision. This drive new business and significantly grow revenues without hiring additional sales reps. The booking engine integrates with Google Analytics to deliver insightful reports that help you optimize campaigns and improve conversion. 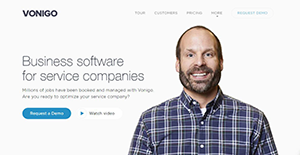 Vonigo is built to support single location service businesses, multi-location companies, and franchises. It enables you to implement the technology needed to propel your service business to the next level. This eliminates human error and inefficient processes that hinder the growth of service business. It makes it easy to define rules to manage territories and locations as your business introduce services into new regions. The platform observes stringent security measures with firewall protection, bank-grade SSL encryption, and intrusion detection to keep your data 100% safe. You can also define user permission levels to ensure every employee accesses only what they need to accomplish their tasks. There are well-liked and widely used solutions in each software category. But are they automatically the best fit for your enterprise’s special wants? A popular software application may have thousands of customers, but does it provide what you require? For this reason, do not blindly invest in popular systems. Read at least a few Vonigo reviews and think about the factors that you wish to have in the software such as the cost, main features, available integrations etc. Then, shortlist a few systems that fit your needs. Try out the free trials of these platforms, read online opinions, get information from the maker, and do your investigation thoroughly. This exhaustive research is sure to aid you find the best software application for your organization’s unique needs. How Much Does Vonigo Cost? Pricing quotes are available on inquiry. We realize that when you make a decision to buy Field Service Management Software - FSM it’s important not only to see how experts evaluate it in their reviews, but also to find out if the real people and companies that buy it are actually satisfied with the product. That’s why we’ve created our behavior-based Customer Satisfaction Algorithm™ that gathers customer reviews, comments and Vonigo reviews across a wide range of social media sites. The data is then presented in an easy to digest form showing how many people had positive and negative experience with Vonigo. With that information at hand you should be equipped to make an informed buying decision that you won’t regret. What are Vonigo pricing details? What integrations are available for Vonigo? Vonigo also has an open API. If you need more information about Vonigo or you simply have a question let us know what you need and we’ll forward your request directly to the vendor.